Saucon Valley’s Dane Csencsits triggered the Panthers to victory in the 2019 District XI team championship final. 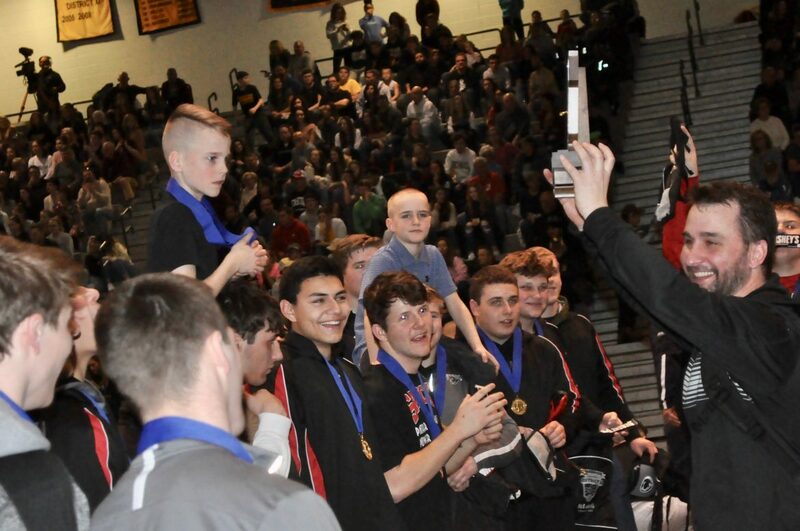 Saucon Valley wrestling has done it again. Five days after winning their seventh straight Colonial League championship, the Panthers willed their way to a fourth consecutive District XI Team title. The homegrown Saucon Valley Panthers hung together and denied borderless Notre Dame’s assembled group of all-stars the 2019 District XI championship trophy. Sophomore Mick Sullivan picks up six against the Lehighton Indians in the District XI semifinal. 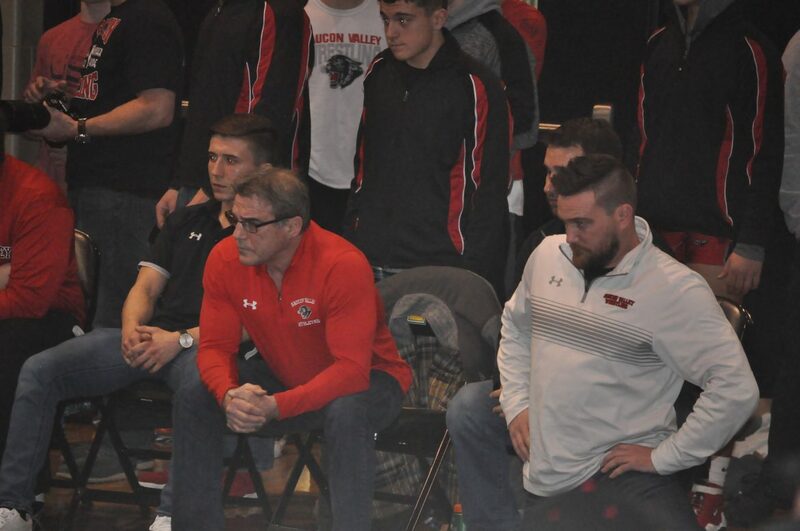 Earlier in the day, Saucon Valley stomped Lehighton 63-12 in the semifinals while Notre Dame got the best of Wilson 39-29. The results set up a much anticipated rematch from the Panthers 40-26 win over the Crusaders back on December 12th. The Panthers and Crusaders once again tangled in a much anticipated rematch. Of the fourteen weight classes, both teams won seven contests. Notre Dame and Saucon each recorded four falls. Notre Dame cashed in on falls from Anthony Morello (113), Josh Bauman (120), Ryan Crookham (126) and Andrew Cerniglia (145). 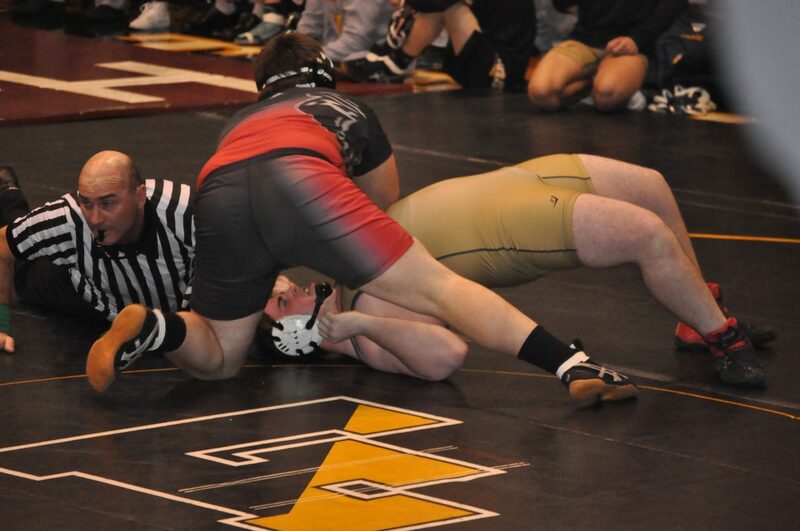 The Panthers got pins from Thomas Spirk (138), Dane Csencsits (195), Jared Harka (220) and Nick Warnke (285). 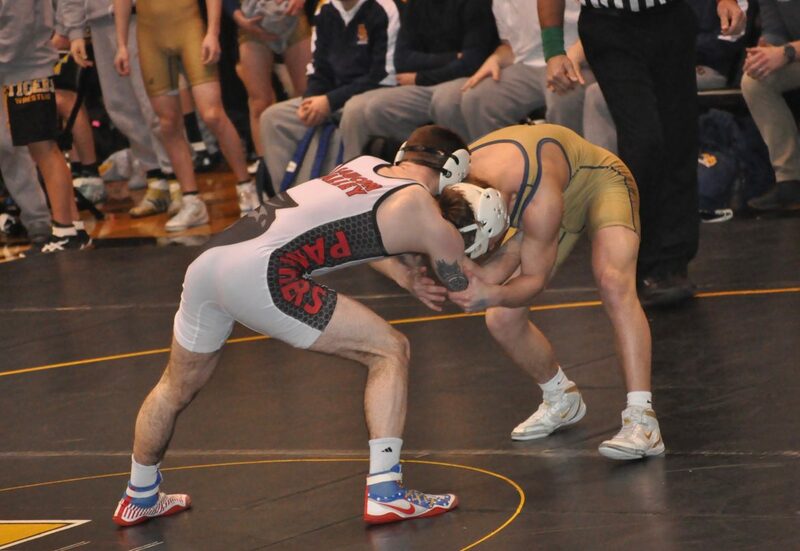 Notre Dame’s other three victories included a couple of major-decisions from Evan Maag (106) and Derek Berlitz (160). Isaiah DeJesus (182) chipped in with a decision for the Crusaders. The Panthers countered with a couple of decisions from Josh Jones (132) and Nick Rosengrant (152). In addition, Notre Dame conceded a forfeit to Matt Arciuolo (170). With his eleven second pin, Panther junior Thomas Spirk was able to cut into Notre Dame’s early lead. The match started at the 120 pound weight class and Notre Dame wasted little time scoring points. The Crusaders jumped out to a 12-0 lead with pins by Bauman (120) and Crookham (126). The Panthers punched back with a couple of wins. Josh Jones (132) fought for a 2-0 overtime decision against Brandon Chletsos and Thomas Spirk planted Notre Dame’s Jacob Wehr in 11 seconds to make the score 12-9. Andrew Cerniglia (145) of Notre Dame tried to swing momentum back to the Crusaders with a pin, but Saucon Valley’s Nick Rosengrant (152) hit a third period takedown and 3 near-fall points to secure a 10-5 decision to make the team score 18-12 in favor of Notre Dame. Saucon Valley’s Nick Rosengrant tumbled and turned his way to a 10-5 decision. Notre Dame’s Derek Berlitz (160) was able to extend the Crusader lead to 22-12 with his major-decision, but a forfeit to Saucon Valley’s Matt Arciuolo (170) cut the Panther deficit to four points. With the scoreboard showing 22-18, Isaiah DeJesus (182) used his 7-1 decision to extend Notre Dame’s lead to 25-18. However the Panther trio of Dane Csencsits (195), Jared Harka (220) and Nick Warnke (285) roared their way through Notre Dame’s upper weights with three consecutive falls. It took three minutes and four seconds of wrestling time for Saucon Valley to jump ahead of the Crusaders with a 36-25 advantage with only two bouts remaining. This Notre Dame wrestler got “Harkatized” in 13 seconds. Not quite all the way out of a dark world of uncertainty, Saucon Valley freshmen Connor Nicholas (106) and Cael Markle (113) would both have to stay off their backs and avoid pins against Notre Dame’s Evan Maag and Anthony Morello to secure the Panther victory. 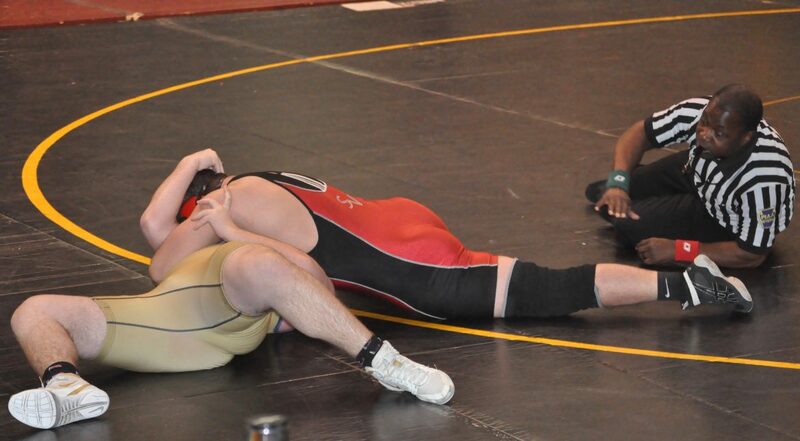 Nicholas courageously battled Maag’s frantic attack and fought off his back in the first period to escape a fall. The outcome was seemingly forever in the balance for the remainder of the bout, but Nicholas refused to give in and limited the doom and damage that a pin could have brought. 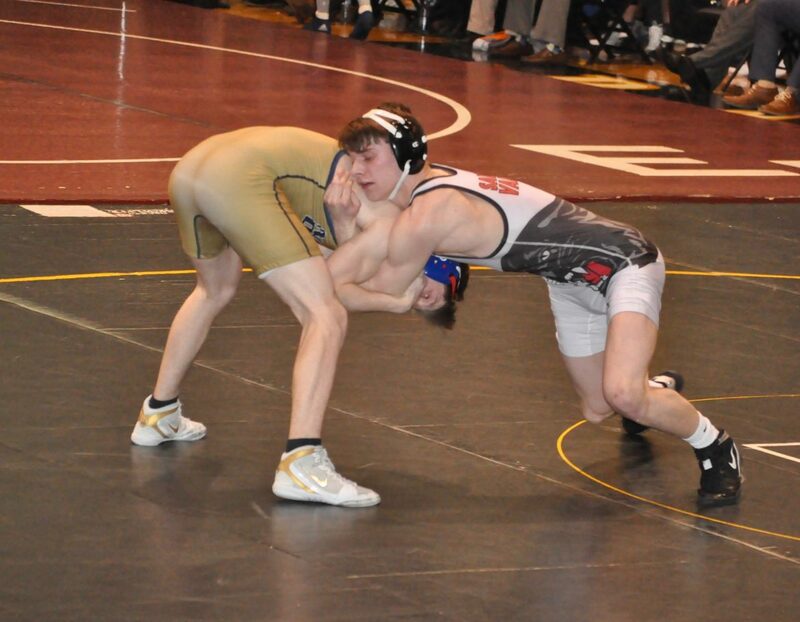 Nicholas surrendered a 12-1 major-decision to Maag, but by not getting pinned, his loss essentially clinched the 2019 District XI title for the Panthers. Freshman Connor Nicholas was able to hang on just enough to preserve the Panther win. Cael Markle (113) and Notre Dame’s Morello did have a very competitive scrap that was decided with Morello’s fall in overtime, but it didn’t matter from a team perspective. 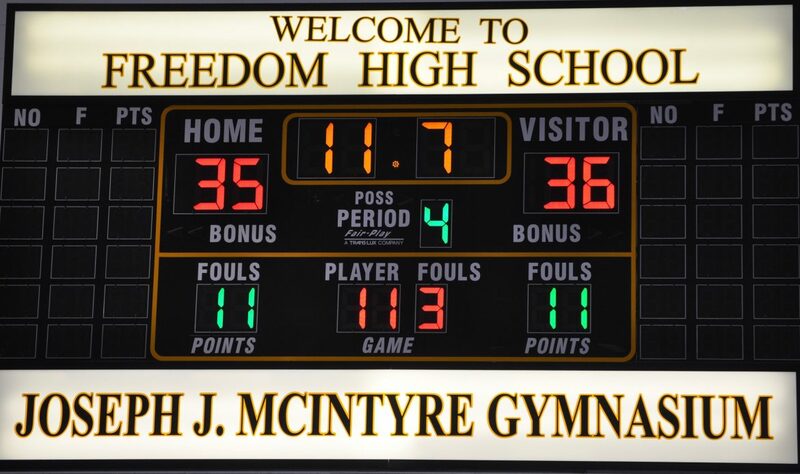 When all the blood, sweat and tears were wiped away, the scoreboard read 36-35 in favor of the Panthers. 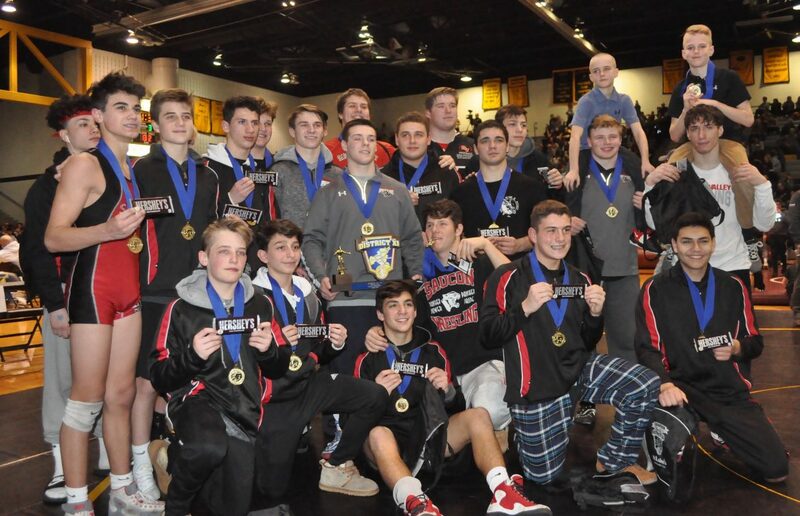 With a gutsy performance, Saucon Valley secured their fourth District XI team title in a row. 106- Evan Maag Fr., ND, major-decision, Connor Nicholas Fr., 12-1. 113- Anthony Morello So., ND, pinned Cael Markle Fr., 6:48 (OT). 120- Josh Bauman So., ND, pinned Kevin Dyer Jr., :59. 126- Ryan Crookham Fr., ND, pinned Ryan Gilbert Fr., :43. 132- Josh Jones Sr., Saucon Valley, decision Brandon Chletsos So., 2-0 (OT). 138- Thomas Spirk Jr., Saucon Valley, pinned Jacob Wehr Fr., :11. 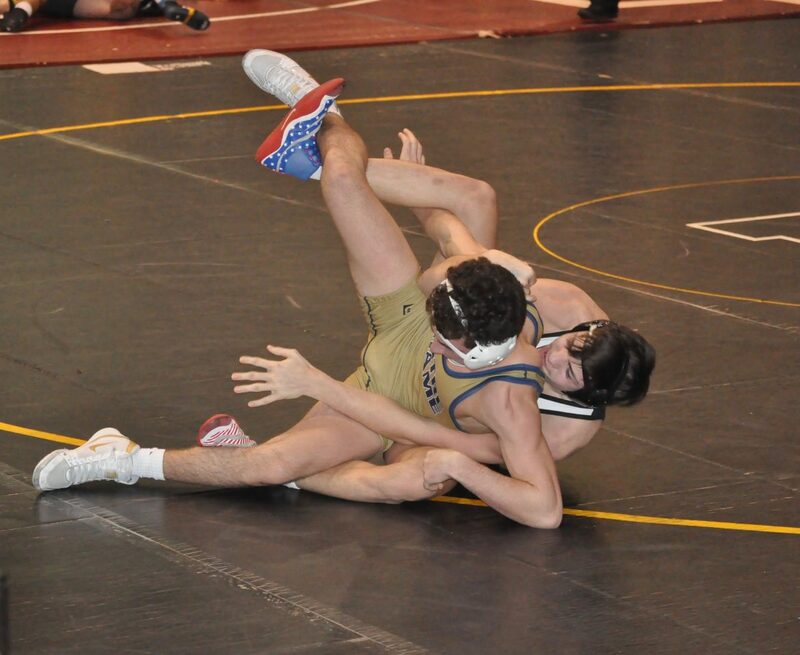 145- Andrew Cerniglia Jr., ND, pinned Carlos Ortiz Sr., :27. 152- Nick Rosengrant Jr., Saucon Valley, decision Nick Vonelli Sr., 10-5. 160- Derek Berlitz Fr., ND, major-decision, Ty Csencsits Fr., 12-4. 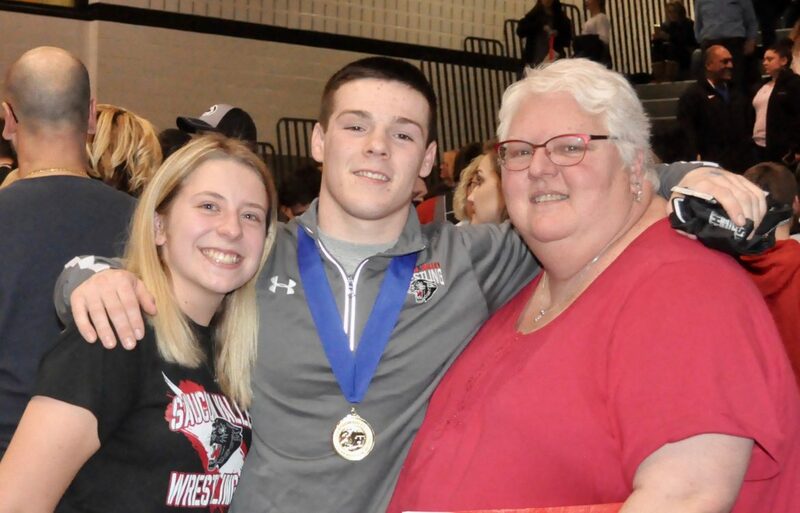 170- Matt Arciuolo Jr., Saucon Valley, winner by forfeit. 182- Isaiah DeJesus Sr., ND, decision Braydyn Lugardo Jr., 7-1. 195- Dane Csencsits Jr., Saucon Valley, pinned Tucker Klump Sr., 1:05. 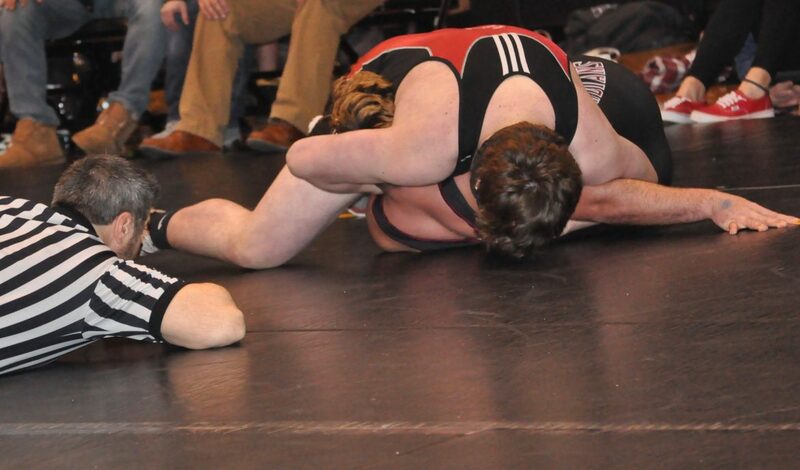 220- Jared Harka Sr., Saucon Valley, pinned Eshan Swartz Jr., :13. 285- Nick Warnke Jr., Saucon Valley, pinned, Anthony Schiraldi Sr., 1:46. Wrestler of the Match – THE TEAM! Coach Shirk proudly presents District XI championship medals to his Panthers. Up Next: The 2019 PIAA State Championships in Hershey! 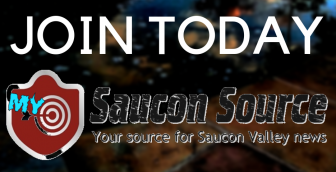 On Thursday at 4 p.m., Saucon is scheduled to battle the Muncy Indians who were the District IV runners-up behind Southern Columbia. The Panthers have a little indirect history with the Indians this season. Muncy finished 7th at the Tom Best Memorial Top Hat preseason tournament with 124 team points where Saucon Valley (233.5 pts.) was crowned as champs. 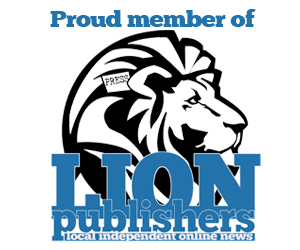 In addition, Muncy defeated Bangor 42-28 on Jan. 5th. 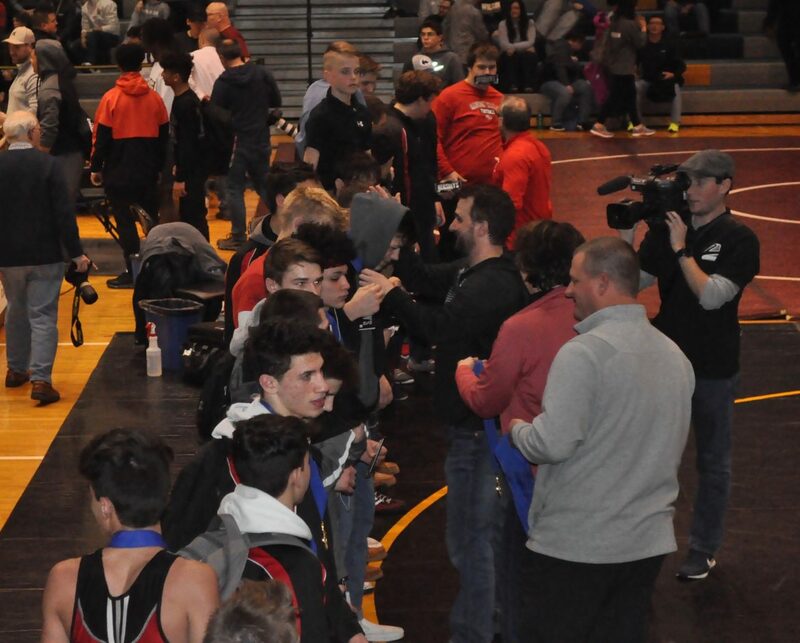 Saucon Valley defeated Bangor 58-15 on Jan. 9th. It should be an exciting opening round of State Championship wrestling action for Panther Nation! **Click HERE to see the Panthers’ 2019 PIAA State team tournament bracket. Josh Jones celebrates with Lauren Polak and Cathy Liebensperger.